At Spin Palace the casino gaming section is renowned for its huge number of games catering for a wide range of casino players globally in Europe, Americas, and Australasia 24/7 and 365 days per year. Since 2001 the casino has been building up its selection of real money online casino games and to this date there are over 600 to play via the Flash version of the casino or via the full software download program – it’s totally up to you. And, you get to choose if you want to play for free or for real money. If you are thinking about joining Spin Palace, you will be contemplating an extremely generous $1,000 free in a 3-part deposit match Welcome Bonus offer. Before you do decide, check out their website and try out some of their games. You can either sign up and play for free, or just visit the casino game section of your choice and play straight from your web browser. Spin Palace gives its members the option to play in its virtual casino, in a LIVE casino or place bets on sports covering a wide range of sporting bet markets with live odds. If you decide to make a wager over in the sports section, Spin Palace will give you a $200 free bet to get you motivated! Play casino tournament, Poker, Baccarat, Blackjack, Craps, Keno, Roulette, Slots, Sic Bo, Casino War, Scratch cards, or Video Poker any time of the day from you iOS Apple devices, Android, Blackberry, or Windows devices either on the move or from the comfort of your own home. Spin Palace has made sure there are no limits to where you can play! Plus, most of the casino games surpasses a 97% pay-out ratio meaning the house only has a 3% edge! This is because Microgaming is mastermind behind the casino platform supplied to Spin Palace, and we all know that the Isle of White based casino developer can put in one hell of a show when it comes to online casino play! The casino is completely trustworthy with monthly eCOGRA reports issued checking that the ratio of winning paid out by the casino is consistent, as well as having regular random RNG checks performed. Moreover, Spin Palace is licensed by the Malta Gaming Authority (MGA) as well as the Kahnawake Gaming Commission (KGC). Immediate impressions when you visit the website are that of quality and organisation. 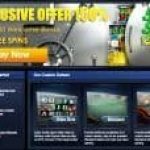 The entire site is full of information, the gaming sections are easy to navigate, and the functionality is entirely user-friendly. Even newbies to online gambling will quickly figure out how Spin Palace operates. If Spin Palace has the look and feel as well as sound like the kind of online and mobile casino experience you are looking for, then read on for a more in detail review as we break down the casino bit by bit covering all the details. Microgaming introduces all the online casino games to the Spin Palace gaming section via its cross-platform delivery system operated by none other than Quickfire! That means you can expect high quality 3D animated and cinematic gaming from whatever the device you are connecting to the casino from. As for the way the games at the casino are presented, they are divided into easy sections. Having the casino laid out in this way means that if you are only interested in Blackjack, you can just click on this section of the casino and have only Blackjack games presented. Using this set-up you can sift through only the variations of Blackjack available to you without dealing with the clutter of other games you may not want to play. At Spin Palace most members play on the slots. They are by far the most popular online and mobile casino games. Microgaming is famous for inventing the 243-Ways to Win slots with no-pay-lines, and then increase this up to 1024-ways to win by expanding the number of positions symbols can land on. In addition, there are plenty of 5-reel, 3-reel, 9 pay-line, 15 pay-line, 20 pay-line and 25 pay-line slots. Most of these slots have an RTP of over 97%, which is pretty amazing! Microgaming’s huge progressive jackpot network connects hundreds of online casino operators to progressive slots on their servers. Spin Palace is also connected, and so you can just imagine how much cash gets pumped into these machines. Some pay-out millions in cash! Whether you are new to Blackjack or a player that has his/her optimal strategy fine tuned to a variation of the game, the Blackjack section is sure to have a version or multiple versions of the style that suits your level best with over 40 to choose from. Even more inviting is that there are Blackjack tournaments regular underway. Another popular game at Spin Palace is Roulette. There are several variations you can play from the American version of the game with ‘0’ and ‘00’ as well as the French/European versions with just the ‘0’. You can also play one board with multiple wheels spinning in Microgaming’s well-known multi-wheel version of the game. Video Poker fans are in for a real treat at Spin Palace. There are 50+ versions available. Video Slots are essentially based on 5-card Draw Poker. When you start to look at the choice you have in this section, you will be stuck because there are so many variations of the game to play and learn. There are literally tons of fun to be had here! There are tons of other games at Spin Palace that are also popular amongst casino players. They also, come with their own sections and variations of the games available. Add these to the Blackjack, Roulette, Video Poker, and slots and this completes Spin Palace’s all-round offering. With Microgaming having Quickfire deliver its games to Spin Palace, as you would expect, there are tons of mobile games. There are no holds barred when it comes the number of devices Quickfire can stream Spin Palace games to players that want to turn their mobile device into a mini casino with games available on the move. Every device is different and Spin Palace knows that means having a reliable system in place that is able to detect and stream mobile games that match the hardware and bandwidth the game will function on. With advanced technology, mobile players will experience nothing less than the finest mobile and casino gaming interactions! For some authentic casino play, the LIVE casino interface at SPIN palace is first-rate. Whichever game you are playing, you can bet using your virtual chips, and then watch the dealer as the action unfolds. All the features, such as chip denominations, bet history, and quick tops are available just as you would get in the virtual casino. Plus, unlike some other online casino, at Spin Palace you can use your Casino Welcome Bonus code to play on any of the LIVE tables. Keep your eyes peeled because Spin Palace is about to release its own sportsbook which is already being tested in beta. All the latest sporting events will be covered as well as betting options on up and coming events such as the Olympics, World Cup, skiing championships and more. Premiership football, Championship football, La Liga, Serie A, Bundesliga, Champions League, and UEFA cup football will all be dishing odds. First goal scorers, predict the correct score or outright match winner as well as who bets in relegation and promotional battles. The latest markets will be covered with Horse Racing events covering the flat and jumps daily, plus you can expect odds to be dished out on the Grand National, Epson Derby and Dubai World Cup when they come around. Furthermore, expect to see Rugby League and Union, e-sports including League of Legends and Dota 2. Tennis and Golf with coverage of ATP and PGA events. Motorsports will be on there too with F1, Speedway, and V8 Super Cars markets open for bets. There really is going to be a lot put into the Spin Palace sportsbook, which will also include its own In-Play betting options so you can watch and place bets on the action as it is in play! All the action will be available for all devices, so you will be able to place wagers in your favourite sports at home on your PC or while on the move via your mobile. You have the option to play at Spin Palace via its Casino Download Application or you can play games directly from your web browser. Once you have logged in, you can choose to play for free or play for real money. The software app is easy to download and will be added as a shortcut to your mobile device in the same way as any other app for easy one clicks access to open the casino. You can then select and download games in an instant. Learning to use the app is simple. The casino is laid out to give you one-click access to banking options, support, Roulette, Blackjack, Slots, Progressive Slots, Craps, and more. The app is always in sync with the casino via a secure SSL 128-bit encrypted tunnel that is always changing its sequences so if there is any sign of hijacking the casino will auto disconnect the session until you decide to log back on again. All this comes with disconnection safety measures, so you do not have to worry about chips left on the table or your bets in progress as this will all be protected. If you don’t log back on, the chips on the table will be credited back to your casino balance. For those that prefer not to download, then no problems at all. Just sing into the casino from a browser with HTML5 capabilities. Once you have logged in, the entire casino suite of games, banking, and support will be available via the Spin Palace mobile web version of the site. As per the mobile app the same SSL encryption and disconnection protection applies. Spin Palace uses the very best of Java and HTML technology. From the moment you connect to casino your every move will recorded in real time so your account will always be up to date. Any bets made, chips taken to the tables and then taken back off the tables, plus your bet sizes and betting habits are also tracked. You never have to worry about any of the math because Spin Palace’s intelligent software working coordinated with your account ensures nothing goes amiss. There is no doubt about the trustworthiness of Spin Palace’s online casino offering. With Microgaming’s software platform streaming the casino’s games, you can guarantee this is one place that is 100% safe to play. First, the casino holds 2 licenses. One from the Malta Gaming Authority (MGA), and second from the Kahnawake Gaming Commission (KGC). Both require Spin Palace to undergo regular licencing checks that are performed at random. Furthermore, eCOGRA has endorsed the casino and all the games presented. Both the online and mobile casino must provide regular reports upon request to eCOGRA. These reports reflect the randomness of the gaming results the casino produces, and time after time Spin Palace passes with flying colours. The casinos Random Number Generators (RNGs) are the main aspect of the casino’s integrity that eCOGRA are monitoring. As Spin Palace has so many slots with 97% RTPs, eCOGRA have to check that this is the case when the reports are requested of the casino at random intervals over the year. In addition to this, all 3 regulatory bodies, eCOGRA, KGC, and MGA ensure that the casino passes tests to ensure that it is using 128-bit financial grade encrypted technology for both banking and connections. They also check the LIVE dealer suits to ensure that the results there are also completely legitimate. It is also worth noting that all personal details are kept completely safe on the casino’s servers. All data protection and privacy laws are abided to, and all personal information is stored in a protected environment protected by state-of-the-art technology. All employees are fully trained and have passed stringent background checks. Over in the support department, they cannot just access your personal data when they feel like it. They must retrieve security answers about your account first. Even when they do access your account, they cannot see you card details. The entire session is also recorded on the phone, on CCTV and the software records the staff actions on the computers in the support offices. With all these systems in place, fair banking, fair play, and responsible management of player cash and personal information is guaranteed. We are all in it for the extras, and Spin Palace knows this only too well. With that, this is one casino that makes sure its clientele is treated well when it comes to keeping their casino balances in the green. The main point is to make sure that players can keep on playing their favourite games. With more time playing, the more chance there is of hitting a big win along the way! Straight away when you sign up and make your first deposit, you are greeted with a 100% deposit match bonus up to $250. It doesn’t stop there. A second deposit can be made and another deposit match bonus is available. This time it is a 25% deposit match up to $300. Additional bonuses are awarded all the time. Players will have these bonus options announced to them via email, or on their app, by SMS or as a pop-up. Free spins, credits and bonus cash are all up for grabs. Each time you wager €10, then you are awarded with 1 Club Point. The loyalty program is always done to the value of Euros, so which every currency you play in, it will be converted and counted as a Euro payment. 1,000 Club points can be redeemed for a total of €10 credited to your bonus account. Collect enough club points and you will climb the VIP levels. Start at Blue and work your way through, Silver, Gold, Platinum, Diamond, and Prive. You can get faster withdrawals, invites to exclusive events such as 5-star hotels and luxury getaways, VIP tournament participation, VIP Host team and personal manager, earn Loyalty Points faster as you climb the levels helping you reach the next level in record speed, and you can be part of weekly VIP promotions. If you are a high roller, then this is one casino that will roll out the red carpet and make sure you are treated like royalty. At Spin Palace the customer service team is extremely helpful. They have had some really good reviews due to their knowledgeable staff who have all be trained to know every aspect of the casino. Don’t expect automated answers because this is personalised support! You have a question, problem, or need something, they are there to help – very impressive indeed and open 24 hours a day every day of the year. English, French, Finnish, German, Italian, Japanese, Latvian, Norwegian, Polish, Portuguese, Spanish, Swedish, Dutch, Greek, Russian, and Turkish. As every casino mentions, there is 128-bit financial grade encrypted security with every connection. All card transactions are safe, and even the customer service agents cannot see you full account details. If you are paying via an e-wallet, which Spin Palace encourages too, then you are totally protected because all you need to do is provide an email address. Why Play at Cloud Casino? If you are a fan of Microgaming, then that is the first reason you should have to play at Spin Palace. With over 600 games to ponder, you are not going to be stuck for choice. Slots players have tons of options. Blackjack players have over 30 variations to play, plus more variations in the LIVE dealer suite, then same goes for Roulette players. In addition, for those that love Baccarat, Keno, Scratch cards, Craps and in general an all-round casino gaming experience, Spin Palace has it all. Plus, if you are a player that prefers to play from an app, you have the quality of Spin Palace’s and Micro gaming’s application download. However, if you are not a fan of downloads, then Spin Palace is still for you! The HTML5 web based interface will ensure that you can play from almost any HTML5 compatible browser meaning you have instant access to a ton of real money casino games. All you need to do is log on, and it doesn’t have to be from your own computer. Even if you have downloaded the app, you can still access your Spin Palace account from any web browser, plus you can play from any device. Android, Windows, Blackberry, and iOS owners can all play at Spin Palace. Moreover, if you own multiple devices i.e. a Blackberry, an iPad, and a PC, you can still log onto your account from all devices via the app or browser. This is pure flexibility in the making. High rollers are treated fantastically at Spin Palace. The VIP program offer so many extras! Low rollers have every chance of becoming one of the whales, just keep on playing those progressive jackpots and you never know – Mega Moolah or Major Millions could get you there!